Contributors to this Newsletter are: Karen Finch, Marianne Gächter, Daniela Lunghi, Margaret Ribbert, Gudrun Sporbeck, Monica Vroon. Thank you all very much for your interesting information. A new problem arose this time: some of the exhibitions announced by members were alsready finished before my Newsletter was ready. Therefore I started a new section on my homepage, one on exhibitions and one on bookreviews. If you send information to me I will publish it instantly there. Later on you will find these comments also in the Newsletter. Please contiunue to inform me about chalice veils, and I would be very glad for your opinion about the vocabulary, so far I only had very few comments. 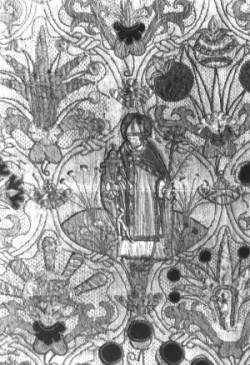 a late medieval chasuable from the collection, which has has been restored. tues-fri: 10 to 17h, sat. and sun: 11 to 17h, every first wednesday of the month until 20 h.
the course is intended for conservators and restorers who are ore will be working with textiles in museums. For more information about purpose, qualifications, program, language of courses ask the above adress. Admission: the course is free of charge for a maximum of 25 persons. A selection will be done by means of a short curriculum vitae which has to be sent by interested people to Poldi Pezzoli Museum. Please send your request and the curriculum until 10th of march 2001 to the above adress. The selected persons will be informed by telephone. and 2 numbers of "Notizie soffici" which is a textile magazine of Museo Poldi Pezzoli. Materials, fibres, colours, iconografic language. Signs of history and usage. The Textilmuseum acquired in autumn 2000 a table cloth with whitework embroidery (TM 50202) with scenes of the life of Napoleon, this table cloth is very similar to the embroidery published in Newsletter 3, Sept 1996, of V&A Museum London, No Circ 128-1951. 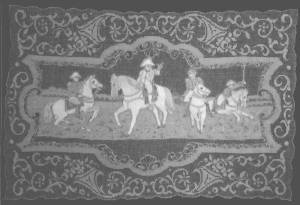 A set of the same kind of embroideries, also with scenes of Napoleon and his army, was given to the museum shortly. There are: one runner, 12 place mats and 12 napkins (No TM 50317-50330). An american lady bought these embroideries in Switzerland in 1930. They belong to a group of embroideries which have been worked in Eastern Switzerland, but it is not clear when and in which workshop. The museum already has a table cloth with scenes of Napoleon in its collection, which probably was made 100 years ago. - Napoleon. Von Corsica bis St. Helena. Original-Illustrationen nach berühmten Gemälden von Meissonnier, David, Vernet, Delaroche, Gerome, Gérard, Gros und Steuben, Hamburg, o.J. 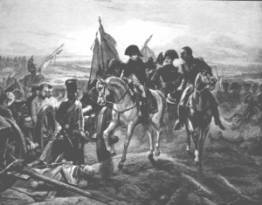 - Napoleon und das Zeitalter der Befreiungskriege in Bildern, von F.M. Kircheisen, München und Leipzig 1914. 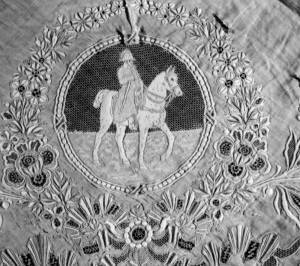 If any members have similar embroideries in their collections, the Textilmuseum and Anne Wanner are very interested to get every possible information about them. "Himmlische Rosen ins irdische Leben"
Iconoclasm - Madness or the Will of God? The exhibition, entitled: Iconoclasm - Madness or the Will of God? authors: Pascale Gorguet Ballesteros, Geneviève Roche-Bernard, Monique Drosson, Vibeke Kingma, Anne Wanner-JeanRichard, Geoffrey Timmins, Serge Chassagne, Marie-Pierre Deguillaume, Jacqueline Jacqué, Morgane Prigent. text in french, 206 p., many coloured and black and white photos. The Schatzkammer is not a museum. Its collection is the remains of textiles that were, and sometimes are still, actively used in everyday church-life. 177 chalice veils. 50 are partly embroidered and 14 embroidered all over. Monica sent photos with a hypothesis of where one or the other were made. - The Altarfrontal of Mechernich (T03002) is interesting in that it is surly made in the same workshop as the altarfrontals that Karen Stolleis wrote about and that was mentioned in Newsletter no. 10, page 9. It is dated 1621. - Blumenpracht Ornat, Dom Aachen, St. Folian Aachen (T00518-19), Chalice veil 1725, Ursulines?, Germany? - Spitzen, Maritheres Gräfin Preysing, Museum für Kunst und Gewerbe. Hamburg 1987. (Catalogue) Germany. Page 8, Illustration No 2. Whitework border consisting of two buratto woven bands joined together. 46,5 x 8 cms altogether, which makes each band 4 cms wide. Ilalian, late 16 century. Caption: Teil eines Wickelbandes (?). Buratto mit erhöhter Stickerei, genähte kleine Randzacken mit Schlingstichbogen. Inventory No 1959.47. 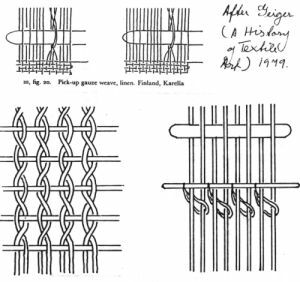 Selvedges visible on both bands. 3 The original is in the Bibliotheca Communale, Brescia. The Decorative Arts Museum, Copenhagen. 7 Dr Floris Mulder. Haarlem ging op wollen Zolm. 8 Yitka Stankova. 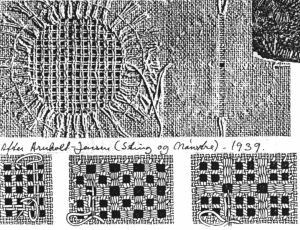 A Chapter in the History of Woven Lace. Arts & Crafts Mus Hamburg Inv. Object No 2715, 16/17 century Italian ?